Provide an application highlighting your knowledge base, professional-level experience, references, and compliance with the code of ethics. You can sign up for a login for the E-learning Course using the code "2019CERPWindow". Once you have completed the course SER staff will upload the certificate of completion to your account at www.ser.org. An initial application fee is due with submission of a full application. This fee is non-refundable, regardless of the outcome of the application. Once certified, the certificant will pay an annual maintenance fee each year. In order to renew certification, the certificant will pay the recertification fee (in lieu of the annual maintenance fee that year). Fees are shown below in US Dollars. Click the appropriate link in the table to pay your application fee. Make sure that you are signed in to get the correct rate. Complete your application for CERP or CERPIT. The application window is currently closed. The next application window will be open August 12 through October 18, 2019. Professional-level Experience – 5 years of full-time experience (or equivalence) conducting restoration in a professional setting. Project Experience – experience performing restoration projects including performing pre-project baseline and reference site inventories, participating in project planning and implementation, and monitoring. References – demonstration that the applicant is held in high esteem by other restoration practitioners and has exhibited proficiency in ecological restoration. Download the guidelines for reference letters. As part of your application, you will be able to enter in the email addresses of your references. Reference letters must be received before the application window closes. 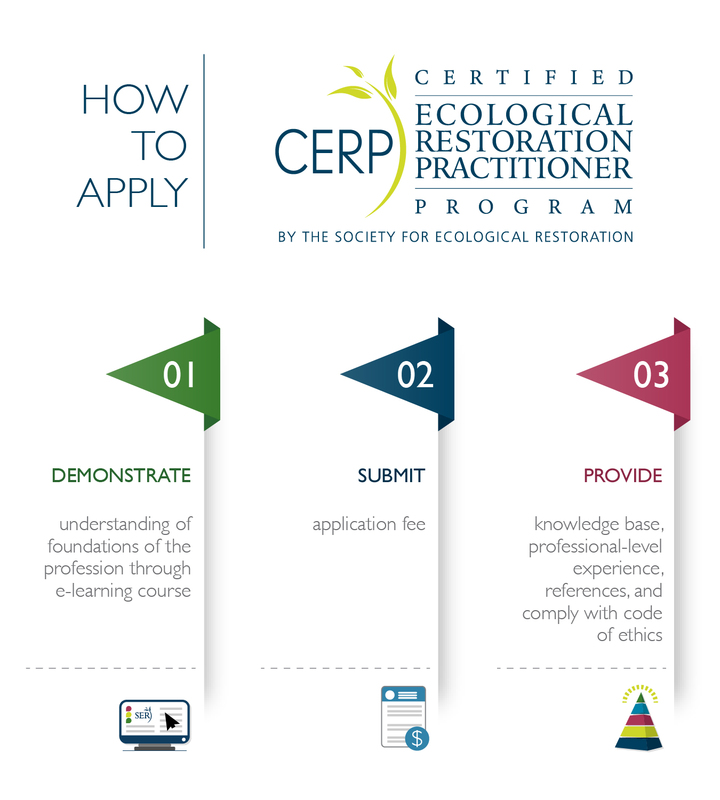 If you would like referrers to be able to email in their letters before you finalize your application, they may email them to certification@ser.org. Ethics and Disciplinary Policies – agreement to adhere to the SER Code of Ethics and the SER Disciplinary Policy. Prior Learning Assessment and Recognition: During the first 5 years of the program (2017-2022) there will be a Prior Learning Assessment Recognition (PLAR) provision. This will allow applicants and those who do not currently have the specified coursework (e.g., graduated prior to the development of ecological restoration-related course and degrees) to demonstrate they have obtained the required knowledge through alternate means.